Solvent 184™ is an excellent cleaner and degreaser used primarily for cleaning automotive parts. It was originally developed for use as a thinner and remover of Hylomar ®, but has proven effective in many applications. Solvent 184 is a great cleaner of electrical contacts, brakes, alternators, electric motors, starters, machined surfaces and much more. It removes tar, wax and petroleum products, and may be used to prepare surfaces for application of sealants and adhesives. Solvent 184 is non-flammable, easy to use and comes in a non-aerosol can with a built-in nozzle cap that reduces waste. Mix HV-350™ with Solvent 184, or any other fast evaporating solvent. Make viscous liquid that can be brushed on. Use as a water proofer, sealant, or on porous materials as glue. 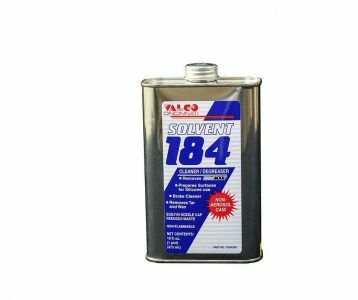 Solvent 184 will be added to Cart! Subscribe for notifications, updates and more!